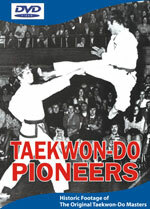 This DVD contains historic footage of some of the original Taekwon-Do Masters. It is a priceless record of the early Pioneers of Taekwon-Do! It combines the “ITF Pioneers” and “ITF Pioneers New Zealand” video CDs, re-mastered at DVD quality to give the best possible reproduction of this classic old footage. The original ITF Training film has been re-captured using the Telecine process (SONY 535, 3CCD Broadcast camera) for the best possible colour and definition. Even if you already own the ITF Pioneers CD, you will really enjoy this DVD version. See the famous 1973 ITF Demonstration Team performing in Germany, featuring Masters: Rhee Ki Ha, Kong Young Il, Park Jong Soo, Pak Sun Jae and Choi Chang Keun - all 7th degree black belts. There is also never before seen film of the Second ITF World Champs held in Oklahoma City (1978). This home video footage includes demonstrations by Master Park Jung Tae and Master Hee Il Cho, plus Master Choi Kwang Jo working out on the bag in his own gym! What you've produced is among the top five "must have" items in the world of ITF Taekwon-Do. It is a beautiful, and beautifully done, record of important ITF history that, for the most part, is only handed down through stories. It is already one of my most cherished TKD items. I would definitely describe this as something every ITF practitioner, past and present, must have.